If pigs could fly they still wouldn’t leave Packington | Packington Free Range | Born and reared outdoors. Always. “DOGS look up to us. Cats look down on us. Pigs treat us as equals.” So Winston Churchill reportedly said. And, like Churchill, I am rather fond of pigs. So I was delighted to be given the chance to pay a visit to the free-range pigs reared by local farmer Rob Mercer. His porkers have a good life, with warm and dry shelters, yet ample open space to enjoy. 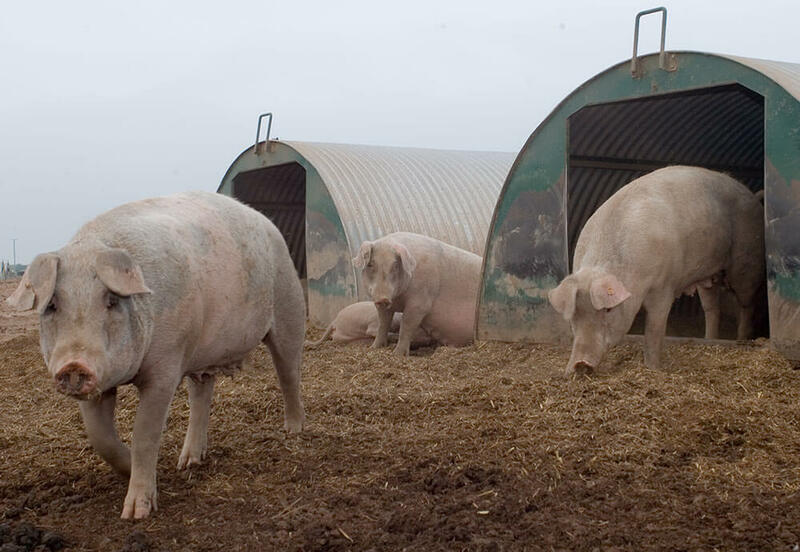 Pig farms are not usually associated with the Midlands, but the pleasant porcine housing estates of Packington Pork are just a mile or so out of Tamworth. Look across the fields beyond Hopwas Woods and there are pigs, shelters and vast open spaces as far as the eye can see. It’s old-fashioned farming with the very latest techniques and a place where animal welfare is taken very seriously. Pigs are perfectly adapted to living outdoors all year round, as long as they have a warm and dry pen, according to Rob, who set up Packington Pork as a newly-qualified agricultural graduate back in 2003. Taking on 600 sows, Rob, who comes from a farming family, set to work. Thirteen years later and Rob has 1,200 sows. Each pig will have around two litters each year, averaging 13 piglets with each litter. A sow’s pregnancy lasts for 115 days. The pigs are 50 per cent large white, 25 per cent Landrace (which are known for their good maternal instincts) and 25 per cent Duroc, which are hardy and suit an outdoor life. The boars are 50 per cent large white and 50 per cent Pietran. All this cross-breeding leads to piglets which are of good quality to eat and are suited to living outside all year round. Rob is clearly a man who is happy with his lot. I love it, it’s great. I love the pigs and I love working with the butchers and my staff. “All pigs need is a dry place to sleep, a good diet and plenty of water. “Our pigs are happy, they have a good life and it is an efficient way of farming. But we’re always trying to get better, always learning new things,” he added. Packington Pork boasts 450 acres, all for the pigs. There are eight sows per acre and the pigs will remain on the same piece of land for two years before they are moved and that field is used for crops. As we walk around the farrowing pens, a host of squeaking piglets are making their presence known. Their mother seems largely unperturbed by our presence – at Packington Pork, the animals are well-used to human contact and are perhaps less defensive of their babies than one might expect. The sow will keep her piglets for four weeks. And at the age of four, the sows are exported for low-grade meat, usually to Germany. Rob tells me that most pigs are farmed in East Anglia and East Yorkshire where the soil is most suitable for them. Around 40 per cent of pork produced in England is farmed outdoors, free range, the Packington Pork way. Rob said: “We are one of three farms which farm pigs outdoors all their lives. Pigs can’t sweat, so in hot weather it is important to keep them cool enough. This is done by providing them with wallows full of water where the pigs can have a nice muddy bath to cool down. These pigs are reared naturally without additives, growth promoters or antibiotics. Rob’s ethos is to be as environmentally-friendly as possible, varying the crops that are grown in between pig occupation of the fields and minimizing the use of crop fertilisers, pesticides, herbicides and fungicides. As I go to leave the farm, I turn to look at the sows who are contentedly rooting in the fields. They really do look as happy as pigs in muck!